The Morris Minor car collection and other vintage and classic cars reside at Harcourt North on a few acres near Castlemaine in Victoria. The Morris Minor was the first British car to sell a million units. As that milestone approached the British Motor Corporation (BMC) decided to mark the occasion by producing a limited edition vehicle. Though commonplace today, this was a new concept in 1960. Appropriately named the Minor Million, this unique vehicle was limited to 350 units and the two door saloons were used and they were distinguished by vivid lilac paintwork and the engine was a standard 948cc. Other external features included chrome wheel rim embellishers and special 1,000,000 badges which were fitted on the sides of the bonnet and on the boot lid. The interior sported ‘white gold’ leather seats with black piping and contrasting black carpets. The actual millionth car rolled off the production line on the 22nd December 1960. The car was distributed to all the BMC dealers in the UK, so that every showroom had a Minor Million on display for the official launch to date of the 4thJanuary 1961, 30 of the 349 replicas were sent to overseas distributors. The question why the Morris Minor Million was painted lilac has always intrigued many people. Unquestionably it was both striking and unusual, even if it was not to everyone’s taste. The answer remained a mystery for many years until a chance encounter made at a Morris Motors Ltd reunion dinner held at the Heritage Motors Centre in 1998. Recollections of the work of the Publicity Department in 1960 led to an interview with Mr. Jack Field. At that time, he was closely involved in securing maximum publicity for the historic landmark of one million Morris Minors being produced. A Morris Minor saloon, chassis number 881386 was taken off the production line in November 1960 and turned into a prototype Minor Million. Jack Field remembers the occasion well. Along with his collegues, Jack began investigating the prospect of having a special paint colour for the limited edition series. The preferred choice was to have gold or silver metallic paint finish. The matter was investigated by the paint technicians, however, the initial results were not encouraging as these finishes could not be guaranteed much beyond six months. This prompted a review of more distinctive colours which could be offered in conventional paint finishes within the existing ICI colour range. Jack had a number of cars painted in vibrant colours including yellow, pink, lime green, orange and Lilac. Once ready, Jack invited representatives from BMC management to a specially arranged viewing with the intention of arriving at consensus on which colour to adopt. Unfortunately those present could only agree not to have orange! In an unusual delegation, for such a milestone, management agreed to let Jack Field select the colour! He chose lilac and the rest they say, ‘is history’. Richard and Bill are not professional restorers. However they are most definitely enthusiastic and dedicated Morris Minor devotees. Bill is a retired Bank Manager and Richard is Creative Director in his own Graphic Design company. Nethertheless, through hard work and dedication they have overseen the transformation of what Richard engagingly describes as a ‘bitser’ car, to one that would grace any Concours d’Elegance competition. Their enthusiasm shines through the book which is written with feeling and contains lots of practical advice gained from first hand experience. It is not a technical manual, however, it is an invaluable guide to the practical aspects of completing the many detailed and often complicated tasks which the home based restorer inevitably has to grapple with. One of the main strengths of the book is the quality of the photographic material. What is also significant is that although the vehicle in question is a limited edition model, it is in essence a standard two door Morris Minor Saloon. As Richard points out the principles involved are equally applicable to any Morris Minor, though the detail specifications may vary slightly from model to model. Possibly the best advice anyone can have when contemplating restoring a Morris Minor, or any other car, is to join a car club. If a single make club exists consider joining that one. The advantages are many, but the main one is that it will open up to you a pool of like minded members willing to pass on their knowledge, often free of charge. They can point you in the right direction in locating specialist services and local contacts. We are members of several local and National Australian car clubs. However, it has been the membership of the Morris Minor Club in the UK that has paid us dividends, particularly through their publication ‘Minor Matters’. This has linked us to the UK, where our restoration car was built. It is important to note that Australian built cars differ somewhat from their English counterparts. Components like fresh air heaters and heating connections, seating patterns and materials, door frames are just a few of the areas of difference. I met Richard in Canterbury, Melbourne in 2011 for this interview and this article was updated in 2014. He has given me permission to refer to his publication, “The Morris Minor - One in a Million”. The Morris Minor Garage at North Harcourt has 20 cars on display. This includes Vintage Chevrolets, Morris Minors and EH Holdens and memorabilia. “The Morris Minor Garage project has really gained some momentum in the last three years. 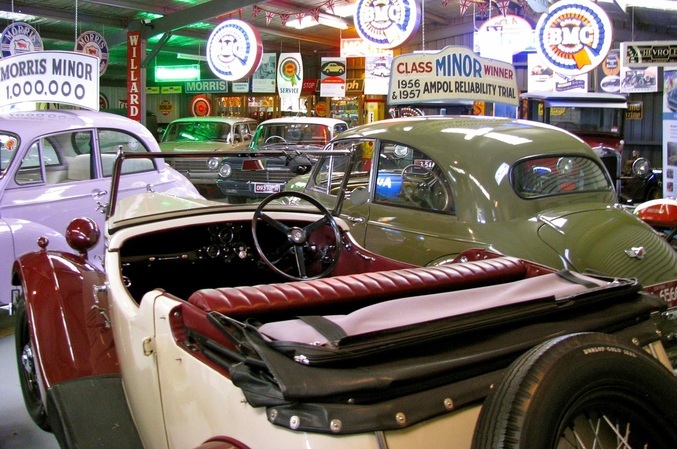 The collection is regularly visited by Car Clubs /, Probus, Rotary Clubs, and other groups. “The Garage is only part of the story. A recent edition is the General Store Café. ‘We found that groups were lingering longer - so the edition of a Café selling great coffee and local produce, would go down well with the visitors’. The ‘General Store’ themed café is really a walk down memory lane for most. “The Café boasts fabulous views from the deck - and we invite groups to stay a little longer and take it all in. Groups are encouraged to picnic on the grounds and use the BBQ facilities in the court yard. A walk around the magnificent garden is a must. The garage is open strictly by appointment only for groups of 10 or more. 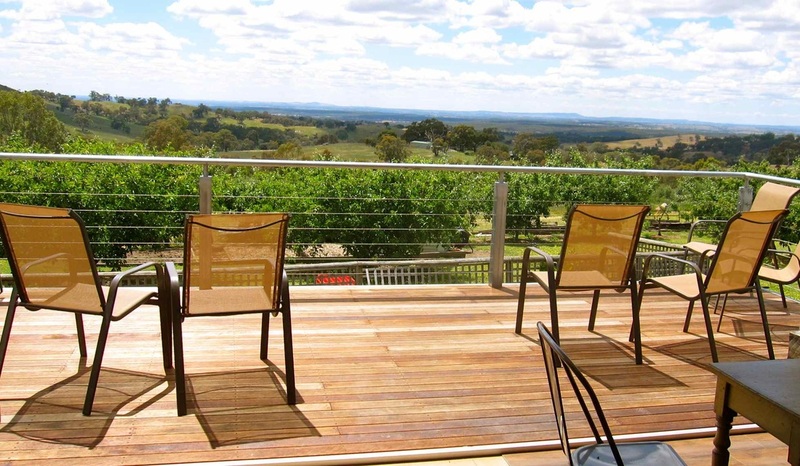 See photos below of the Café and scenery of Harcourt North in Victoria. Contact Richard at rmdesign5@bigpond.com or on 0409 351 508 for more information.